When it comes to Indiana pesticide storage, safety is the most important aspect. Proper storage practices keep pesticides from entering water sources such as rivers, streams, lakes, and oceans, and prevents pesticides from contaminating groundwater. Rules and regulations are in place in the state of Indiana to maintain safety in pesticide storage. These requirements protect the environment and community. Keeping your Indiana pesticide storage building or cabinet locked will restrict access, preventing unwanted personnel and children from endangering themselves and others. Your pesticide storage building should be kept orderly, with original labels and warnings visible to all who enter. This also helps personnel to spot and rectify leaks, spills, and corrosion. In Indiana, pesticide storage should be segregated from other materials to avoid contamination of chemicals such as herbicides, fertilizers, and feeds. Pesticides should be stored on metal racks or shelves, low to the ground, with your dry substances on pallets. Safety standards require that No Smoking signs be present in your pesticide storage area, with a fire suppressor on hand in case of ignition. Sources of ignition should be kept distant from your pesticide storage, and your pesticide storage building should be dry, well-lit, and mechanical ventilation can help to avoid buildup of hazardous vapors and heat. Personal safety dictates that an eyewash dispenser with clean water be available, along with soap and a first aid kit in case of accidents. Minimize the need for off-season storage by only storing the amount of pesticide needed for a single season. When it comes to Indiana pesticide storage, if your pesticides are inventoried and dated, this will enable you to use your oldest pesticide containers first. Always supply a Material Safety Data Sheet for all pesticides stored to help you and your personnel understand the characteristics and hazards of each chemical. Your Indiana pesticide storage is best kept in a separate building designed specifically for pesticide storage. A proper pesticide storage building in the state of Indiana will adhere to all safety standards, providing mechanical ventilation, secondary containment, and fire safety. These are only a few features we offer to maximize pesticide storage safety. 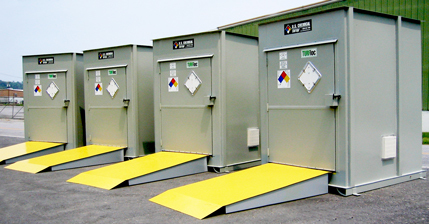 Secondary containment in particular is an important feature of our pesticide storage buildings, designed to prevent leaks and spills from escaping your storage building. Your pesticide storage building can be furnished with our optional accessories to maintain your pesticide storage. While this document may cover a number of important compliant pesticide storage solutions, it cannot address every single situation for keeping pesticide storage maintained and compliant. Refer to your state’s regulations and federal documents for total coverage of compliant regulations.